We’d love your help. Let us know what’s wrong with this preview of The Journal Of Joshua Loper, A Black Cowboy by Walter Dean Myers. 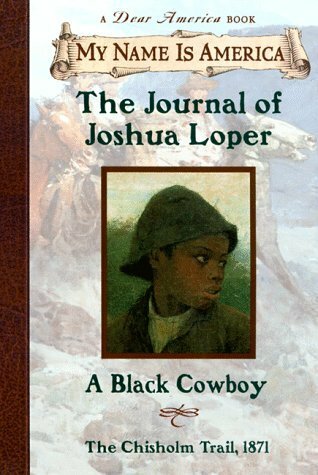 To ask other readers questions about The Journal Of Joshua Loper, A Black Cowboy, please sign up. Is the story based on true incidents or is it fiction? **the True Snow Queen** This is historical fiction, not a true story. Well let me start off by saying I only know about cowboys from books and movies. So this was enlightening about the cattle drive cowboys. This is from the series My Name Is America, A Dear America book. This is the boys version of the historical fiction diaries. In this one we get to know Joshua Loper. He was what we would call a teenager, but at the time was expected to be a man. You actually wanted more of his story when the book was done. There was one spot in the book that made me ball my eye Well let me start off by saying I only know about cowboys from books and movies. So this was enlightening about the cattle drive cowboys. The Journal Of Joshua Loper, A Blake Cowboy by Walter Dean Myers is one of my most favorite books that I have read. I give this book a 5 star rating because of all the conflict. Joshua Loper was a black man that was for Texas that brings cattle to Abilene Kansas and lode therm p on trains and brings the to the butcher so that they can get the hide from the cattle. The thinks the I liked is everything. The most thing that I like the most is the that it is a western and it is just good. There is n The Journal Of Joshua Loper, A Blake Cowboy by Walter Dean Myers is one of my most favorite books that I have read. I give this book a 5 star rating because of all the conflict. Joshua Loper was a black man that was for Texas that brings cattle to Abilene Kansas and lode therm p on trains and brings the to the butcher so that they can get the hide from the cattle. Even though these are kids books, I love reading them. I can finish one in 2 hours and I love the historical content. I love that it's in journal form. I love how they do an epilogue about the rest of the child's life and then about that time in history. This was a subject that I knew nothing about. I've never really paid attention to the cattle drives of the late 1800's, and I didn't know anything about black cowboys. Interesting book. In the book The Journal of Joshua Loper, A Black Cowboy by Walter Dean Myers from the book series “My Name Is America”, it talks about Joshua Loper’s experience with the cattle drive. The book is in the form of a journal, with day by day entries. Joshua Loper is a teenager of a former slave. He joined the cattle drive from Texas to Kansas. The leader is strict, and kind of picks on Joshua for keeping a journal. They all have to keep watch in shifts at night, which is difficult for them. In the In the book The Journal of Joshua Loper, A Black Cowboy by Walter Dean Myers from the book series “My Name Is America”, it talks about Joshua Loper’s experience with the cattle drive. The book is in the form of a journal, with day by day entries. Joshua Loper is a teenager of a former slave. He joined the cattle drive from Texas to Kansas. The leader is strict, and kind of picks on Joshua for keeping a journal. They all have to keep watch in shifts at night, which is difficult for them. In their venture, they need to go through some tough encounters with rustlers and other difficulties and challenges. Through all of this, Joshua shows that he is a good, hard working kid, and the leader of the drive starts to like Joshua. It is all in all difficult to live with the drive. Then, there is a stampede where one of the cowboys dies. Good book, not just got kids. Really get a feel about what it was like in that time period. This was such a sweet book of a son who truly carried for his mother and tried to maintain his morals during some really tough situations. Joshua is a well rounded character who is kind to all and tries his best to keep doing the right thing even if the right thing is very hard for him. He is a deep love of animals specifically his horse Pretty and his a young but good cowboy from the start. Josh is 16 and on his first cattle drive. The trail boss does not want him because of his age and his color. Josh is a quick learner and soon experiences the different parts of the cattle drive. The "pointers" are the first 2 riders who lead the entire herd, the "swings" who wander from the points to the "drags" at the rear. The pointers also set the pace and the drags need to be aware of the gait so they don't speed up the rear into the swing area. The time of the cowboy and trail drives was a rather short period in our history. It was primarily between 1871 and 1882. Most drives were between Texas and Kansas stockyards and later when rails went to Wyoming, Texas to there. Sleeping under stars, singing to cattle to calm them, sleeping but ready to spring up for stampedes or rustlers after horses or cattle. It reads more like a first person narrative than a "found journal" story. Which wasn't bad so much as different. Not really too my taste. I'm more for the actual journal nature of the other Dear America series books. The history is fascinating but I found myself being a little bored by the story. I can't really say why. It was a cattle drive, which is hard grueling work but not really tension filled. I'm not sure... can't really put my finger on why exactly I was bored through most of the book b It reads more like a first person narrative than a "found journal" story. Which wasn't bad so much as different. Not really too my taste. I'm more for the actual journal nature of the other Dear America series books. The history is fascinating but I found myself being a little bored by the story. I can't really say why. It was a cattle drive, which is hard grueling work but not really tension filled. I'm not sure... can't really put my finger on why exactly I was bored through most of the book but I was. And for that reason I have to give it a lower score. Maybe it's just that I already know a lot about cowboys and cattle drives since my mother used to live on a cattle ranch. It's not really new to me. Interesting but nothing new. The Journal of Joshua Loper tells the his story from the first person point of view. The story illustrates the events of a cattle drive. Joshua captures the details of the drive's movement from Texas, Oklahoma, and Kansas in 1871. Although Joshua is excited to go out on this cattle drive,his mother is reluctant. This story is enlightening and insightful for it underscores a contribution of an African American in U.S. History. Overall, this was a good book. I particularly enjoyed Joshua's "aha" m The Journal of Joshua Loper tells the his story from the first person point of view. The story illustrates the events of a cattle drive. Joshua captures the details of the drive's movement from Texas, Oklahoma, and Kansas in 1871. Although Joshua is excited to go out on this cattle drive,his mother is reluctant. This story is enlightening and insightful for it underscores a contribution of an African American in U.S. History. Overall, this was a good book. I particularly enjoyed Joshua's "aha" moment which was when he realizes that his breakfast is costly and it truly is not worth the cost of his earnings. A curriculum use for this book might be towards improving good citizenship. Since racism is often noted, teachers might reinforce non-bullying rules and find ways to demonstrate good citizenship to others. This is about a African American boy and his time on his first cattle drive. He was free and there were very though jobs for them. It about Joshua being a cowboy and the prejustice of being black. If you enjoy history this is good. This is told though the boys prospective as in Dear American is told though a girl prospective. It good This is about a African American boy and his time on his first cattle drive. He was free and there were very though jobs for them. It about Joshua being a cowboy and the prejustice of being black. My class is doing a unit on the author Walter Dean Myers. This is my first "Dear America" book. Are they all based on real journals? I really enjoyed the book. The writing is simple and honest. According to the historical note, the characters were real people. I wonder if the photo on the front is actually Joshua Loper. I liked that the book is a Texas book, set in Texas during the cattle drive years. I appreciate the story told. I'm definitely recommending it to my 7th graders who are required to My class is doing a unit on the author Walter Dean Myers. This is my first "Dear America" book. Are they all based on real journals? The first time I read this book as a young reader, I loved it. I like learning about cowboys and thought it was so exciting. Reading it this second time kind of changed my opinion. The problem was the writing. I felt like most of the time it was written like Joshua was a seventy old man telling his cowboy life to his grandkids. Like what he was writing wasn't happening but had already happened. I don't know if anyone else read it like that but it just seemed weird to me. Still, I'm keeping the b The first time I read this book as a young reader, I loved it. I like learning about cowboys and thought it was so exciting. This was a quick read, but good. It was an interesting look back into the life of a black cowboy in the 1870s. I had not read anything depicting this place and time, and I enjoyed learning about it. A historical note at the end of the book provided some background on the characters and locations. Period pictures also provide a nice background for the book. There are a few instances of blood and gore, but nothing serious. This review has been hidden because it contains spoilers. To view it, click here. This is a very interesting book on a life as a cowboy. It tells about the lifestyle from that time period. It is kind of a slower book because it is written in a journal format. The overall content of the book is still good and interesting. Overall, I would recommend this book for those that have time to read. I bawled crying at the historical note (epilogue) and experienced great pride in Joshua's meek admission to the other (illiterate) cowboys of being able to read and write. Really a great book for a young man to read! This is an excellent and very detailed look at a cattle drive...it just turns out cattle drives are kind of boring. That said, the spot where it very bluntly said 'History has been whitewashed and movies are lying to you. The old west was very diverse and don't believe anything otherwise' was worth cheers and a standing ovation. Recommends it for: children to teens. Am I the only one who thought "The Captain" had a major chip on his shoulder the practically the whole book, and just took it out on black ppl? real charmer. Other than him, interesting book. I learned a lot about cowboys I didn't know before. My only issue is that occasionally, the author's narration was a bit off. At some points it felt like he was telling a typical story rather than writing in a diary format, and it was a bit jarring at times. Another well researched story of a typical black cowboy on a cattle drive. Thoroughly entertaining and informative. Walter Dean Myers Coms through again. Thought of "The Life and the Legend of George McJunkin, Franklin Folsom, and of the "Virginian". Riding the trails will make a man of you. These are YA books they contain a lot of interesting information not taught in schools. Like one in three Cowboys was a poc. A good read for all ages. Not my favorite book in the series, but worth the read. I did enjoy parts of it quite a lot. Good book, just not completely for me. 3.5 out of 5 stars. Learning about cowboys, particularly while examining its implication in race relations, outside of the hollywood interpretation was fascinating.